We have been using this product for years. We have 5 cats, ranging in age from 1 year to 11 years old. This has been the ONLY cat food we feed our cats. They seem to love it and as they are all healthy active indoor cats, I thought we had a winner. About 5 months ago we purchased a new bag. None of the cats would eat it. I didn't understand. They love this cat food. After 2 days of NOT ONE OF THE CATS EATING, I dumped the bag out on the floor. Included in the food was a HUGE glob of something smelly and greasy. In the middle of this smelly greasy mess was a small rusted wrench. Of course I threw out the food. I put the glob into a sealed baggie (double bagged), cut out the codes for manufacturing the product and sent it to the manufacturer with a letter explaining what happened and I included my purchase receipt. I have not heard a word from them. I think I should have just taken pictures and not sent the items. Their non reply tells me that they do not care about their customers. I do still buy this product as the cats like it so much BUT I now open every bag and check the contents. If it doesn't look right or smell right, I take it back and get a return for it. I then have to purchase another bag. I have tried other brands of cat food and I cannot seem to find one that the cats enjoy as much as this brand. I am disappointed in the Manufacturer. I try to be understanding and patient. One bad bag, from years of buying this product, is still alarming to me. She asks for it by name! 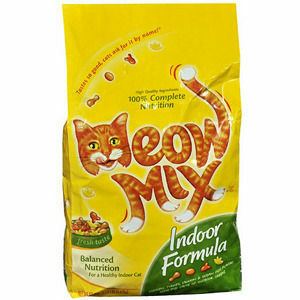 My adult indoor cat really likes Meow Mix. We used to give her another brand but she seemed to loose interest. Since we started Meow Mix, she has really enjoyed eating and always finished her meals. 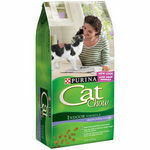 This seems easy for her to eat and digest, with less occurrences of hairballs too! My cats like Meow Mix Indoor Formula Dry Cat Food. They are indeed indoor cats so when I first saw this in the store I bought it thinking that because of the formula and or ingredients as well as the information on the packaging that it would be good for my cats. The like the taste of it and haven't ever rejected it so I have continued to buy it on occasion over the last year or so. The packaging is very easy to close and roll down after opening so the cat food stays fresh. It has a sourish smell to me personally but my cats seem to like the smell of it as they often just take time to smell their foods before eating it or deciding to not eat it. So far so good Meow Mix Indoor Formula Dry Cat Food has been kept in the variety of cat foods rotation I buy , as I try to not bore my cats with the same food all the time. Quality of Ingredients Meow Mix Indoor Formula Dry Cat Food is pretty good as far as quality in comparison to it's price. Flavor Selection The flavor selection isn't very many flavors at all. While I do have several cats, most of them are indoor, and I have found that Meow Mix Indoor Formula Dry Cat Food has worked great for me. One of the biggest benefits that I have found to using this cat food is that it has helped minimize the amount of hairballs that my cats have. This definitely makes me happier since it means less clean up. There is a wide variety of meat flavors. Personally, my cats really like the seafood flavors. I never have any problems trying to get them to eat it. 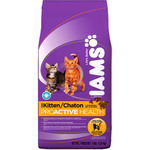 Another pro that keeps me coming back to this indoor formula is the fact that it is very cheap, but they do not compromise when it comes to the quality of ingredients that I feed my cats. I am thankful for a company that looks out for my cat almost as much as I do. If you have an indoor cat, I would highly recommend at least giving Meow Mix Indoor Formula a shot. Overall, it is a really great product, and I hope you find it to be as great as my cats have. I never quite understood the difference between regular cat food and indoor formula cat food, until I started using this brand. 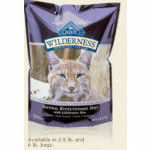 This brand actually keeps my cat's weight under control since he goes outside very little for exercise. The 2 other cat's I have go out some, however they are primarily indoor cat's as well. 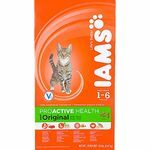 I like this particular brand for my cats because it is simple, I can understand what is on the label without having to look it up. The cat food itself is very clearly meats and grains, which is healthy for my pets to ingest. Quality of Ingredients This product offers high quality ingredients that you can pronounce and understand what they truly are. 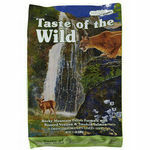 I am confident I am providing the very best for my pets when I feed them this product. Flavor Selection This product offers a very contained selection of different product choices and flavors, which for me makes the decision to continue using it much easier. This cat food is terrible. Meow Mix has a lot of dyes and is made up mostly of grains. Not a very high quality cat food and it really irritates my cat's stomach. Quality of Ingredients They use a lot of dyes in this food. I have found that the dyes ( I think it is the orange dye in the food) really upset my cat's stomach. When we tried this cat food out, she was so sick! She threw up a lot from eating it. Flavor Selection It doesn't seem like there are that many different flavours of this brand of food. Our cats just love it! We've tried and bought different kinds of cat food before, so far this is the only kind that I don't have to worry of throwing away. We have 2 cats. They just love this food. Their bowl is always clean and empty. We bought some expensive brands before, it breaks my heart whenever they would just smell it and turn away. This cat food is cheap compared to the other brands. This is the only dry food we give to our cats for over a year now. We haven't had anymore issue about cleaning up some vomit after meals or early morning, not really a good greeting specially when you just got up from bed. We used to have problem with hairball too but not anymore. Quality of Ingredients Would prefer some more healthy ingredients but my cats love it, who am i to complain.We bought some pricey and more healthy ingredients before thinking that the more expensive the brand is the higher the quality of the ingredients and higher possibility that it would taste good, but our cats wouldn't eat. Flavor Selection They have variety of flavors. Our cats love pretty much all of it as long as it's same brand. This product is not good for your cats. I have fed to my cats and they got sick. The ingredients are very poor. Quality of Ingredients They use mostly fillers and very little meat. Cats actually need the meat. The first few ingredients are all fillers and has no actual meat which is what cats need the most. The product has been recalled in the past because animals have died. The product needs to be reformatted with better ingredients, especially changing the first ingredient to a meat rather than a filler. When my cats have eaten this they have started throwing up and I had to throw away a whole bag of food. Once I switched cat foods my cats stopped throwing up all the time. Flavor Selection There is little options for the flavor selection and my cats prefer more flavor. My cats actually refuse to eat this product. Cats enjoy a wide variety of foods. The options that Meow mix has are very limited and make it hard to purchase for my cats. They especially enjoy chicken flavor. I have meticulous long furred cats who frequently bring up fur balls. because they don´t go outside and eat grass as a digestive aid, a formula like this which has greens mixed in significantly reduces vomiting in my cats. That makes their lives a lot happier. Quality of Ingredients It must be quality, because the cats consistently like it, and the greens mixed in helps them digest well. Flavor Selection Meow mix itself comes in several flavors, but this exact formulation for indoor cats seems to have just one type.